Advantages: Well written, excellent range of tips and techniques, clear informative photographs, professionally done models. 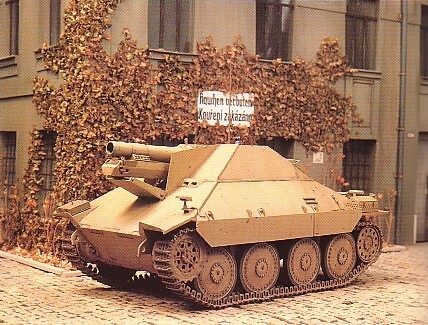 The Jagdpanzer series evolved as a result of the tank killing success of the earlier Sturmgeschuetz. 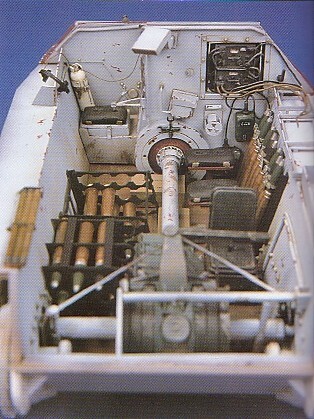 These vehicles were able to carry a much larger gun than would normally be the case due to dispensing with a turret in which to mount them. Their low profile and good frontal armour meant that they were not easy to knock out. Allied bombing took a heavy toll of Sturmgeschuetz production. In an effort to keep numbers of these types at the front, plans were undertaken to design a lighter version. This would allow production to occur at sites that didn’t have the facilities to make the larger vehicles. The result was the mounting of the 7.5 cm Pak 39 L/48 on the Pz.Kpfw.38(t). 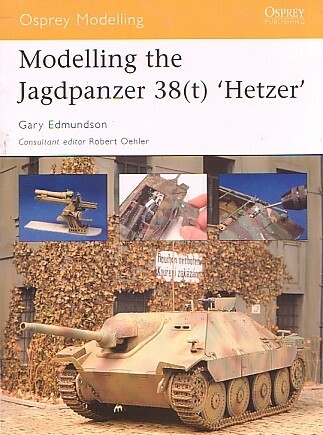 This Osprey Modelling manual covers the so-called “Hetzer” and contains 80 pages in the usual soft cover format. The book is divided up into 8 chapters, which guides the prospective builder through the process of creating an accurate vehicle using various DML kits as a basis. After a brief description of the materials used, the author takes us to the “meat” of the book. Four projects are covered, each with various degrees of difficulty. The subjects are based around the appropriate Dragon kit with the addition of an assortment of after market sets to either enhance or create the necessary detail. The first project falls into the intermediate skill category and shows how to model a May 1944 BMM production “early” Hetzer. As with all the projects, colour photos are presented at various stages of the assembly process and this gives the reader a clear view of what is involved during construction. 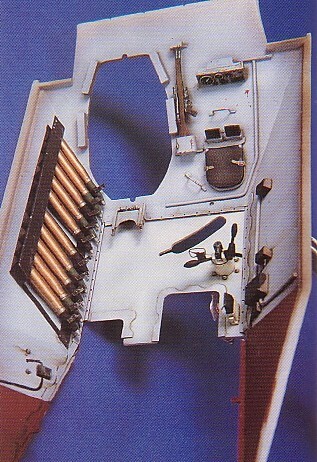 Being of intermediate skill level, the chapter is confined to the external details of the Hetzer. 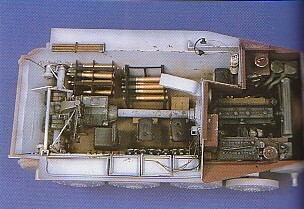 All of the expected areas are covered including the hull, tracks, gun, mantlet, running gear, road wheels and suspension. Regarding the later, the reader is made aware of the typical “nose down” appearance of the vehicle due to the weight of the gun. Thoughtfully he explains how to scratch-build the new leaf springs to replicate this. The use of etched brass is shown to advantage and is illustrated before the application of any paint. This allows all the enhanced areas to be clearly seen. The step-by-step illustrations continue with the author’s method of painting and weathering the finished assembly. 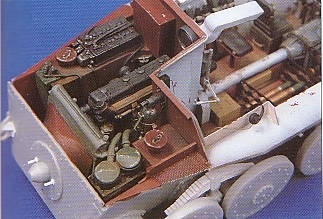 A May 1945 Skoda production “late” Hetzer is next on the list and due to the inclusion of a fully detailed interior, it comes under the advanced modeller category. The author gets the chance to really showcase his skills here by creating a very nice interior, assisted with a selection of after market products. Again, plenty of colour images guide the prospective modeller through the whole process. The third item is more for the master modeller as it involves a lot of scratch building to create a 15cm sIG 33/2 (SF) auf Jagdpanzer 38(t). To achieve his result, the writer uses the New Connection conversion set as a basis, and the liberal use of plastic card. As usual there are plenty of tips, including the builder’s technique for creating weld seams and the logical thought processes needed for the dramatic alterations. 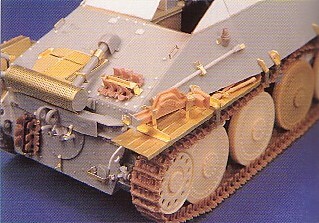 The final project is a Bergepanzer 38(t) and another New Connection Models conversion set is utilised. This chapter also shows a simple way to complete a vignette for displaying your model. Here the author replicated the BMM factory façade from a photo so as too give his model an authentic setting. Everything is described in an easy to understand manner and the simple procedure produces excellent results. The final chapters discuss where one can find additional information on the Hetzer as well as the locations of surviving examples, including the post war builds. There is also a list of available kits and accessories. The book finishes with examples of the colours and schemes used on these vehicles as well as a brief explanation on each. The advantages of a book like this is that the modeller can use it as a “one-stop” source to build their subject without the need to worry about accumulating a more expensive collection of references. There are a variety of projects on offer and each caters to a different skill level. A multitude of helpful hints and techniques are displayed and modellers of all levels should be able to gain something from this publication.